It took a while for a permanent location for the new San Francisco City Hall to be decided on. The early history of the building was marred by scandal and political disagreements. From 1849 to 1850, city hall was effectively located at the Office of the Alcalde which was basically the San Francisco Mayor's office. The location was then moved to Kearny Street for a very short time before going to the Jenny Lind theater which was also at Kearny Street by Washington. Finally in 1872 the very long construction of Old City Hall began and was located at Larkin Street Near Grove. If you are standing on the steps of the current City Hall building and looking out over the plaza to the right, you can see where Old City Hall once was. It was completed 27 long years later in 1899 at a cost of $6 million. An extremely large sum of money in those days! Unfortunately, it only stood for 7 years with the 1906 earthquake taking it down to the ground in mere seconds. What took 27 years to build completely shook apart in 26 seconds. 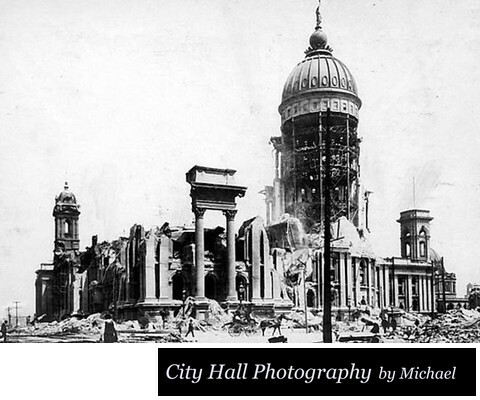 Here is a link to discover more details on how this devastating earthquake rocked the city and destroyed Old City Hall. Though all admitted that this was a devastating and very strong earthquake, many felt that the building was not built very well and this just added to the scandal surrounding it's construction. It became abundantly clear shortly after the earthquake that many shortcuts were taken with the construction of the building. Greedy contractors with little over site got away with murder. More upsetting was the fact that the builders had made guarantees that that the structure was designed to stand up to a large earthquake. Obviously, this was not the case as the only part of the building still standing after the earthquake was the French inspired Dome. The image of the dome standing alone with rubble surrounding it became a favorite among photographers in San Francisco and beyond! You can see it pictured below in this iconic photograph taken shortly after the earthquake and fire tore through the city. Tired of all of the corruption that accompanied the building of Old City Hall, San Francisco voters turned down a 1909 bond issue to build a new one. Then along came James "Sunny Jim" Rolph the new mayor of San Francisco. Mayor Rolph promised to bring the community together and build a new City Hall. After some amount of controversy, construction began in 1912 with the approval of a $8.8 million bond issue by the San Francisco voters. The Mayor smartly limited the design competition to architects with practices in San Francisco. The winning design was chosen in 1912 and Arthur Brown's idea won. His design was patterned off of the many buildings in Paris. Ground breaking occurred on April 5, 1913 with completion occurring around December 28, 1915. Between the land for the site and the building itself, San Francisco City Hall ended up costing around $5 million. My Grandfather may have been friends with Sunny Jim so I am told! When the 7.1 magnitude Loma Prieta earthquake hit on October 17, 1989 there were many that were expecting that we might lose City Hall again. Especially in light of the fact that the dome twisted 2 inches and caused cracks throughout the building. But City Hall held tough and only minor visible damage was present. 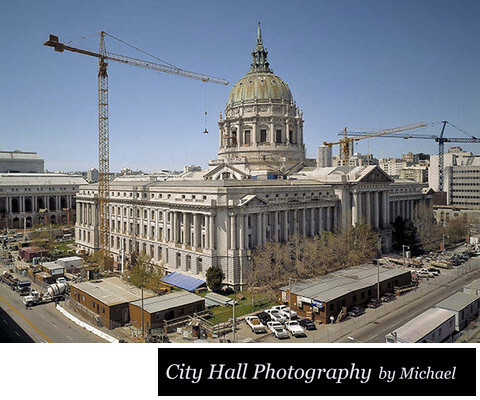 The very next year San Francisco voters passed a general obligation bond of over $300 million for restoration of SF city hall including a seismic retrofit of the entire building to fix any structural damage that might have been caused by this powerful tremor. City Hall now possesses a system of hundreds of rubber cushions to help keep it safe in the event of another major San Francisco earthquake. The system of Stainless Steel with rubber inserts should allow the building to move just enough during an earthquake, preventing it from shaking apart. Then on February 13, 1998 a four-alarm blaze started in city hall after welders left some of the wooden substructure smoldering. The fire was quickly put out and the damage repaired. The entire dome was resurfaced after this event and city hall opened again to the public about 1 year later on January 5, 1999. Another close call for San Francisco City Hall! 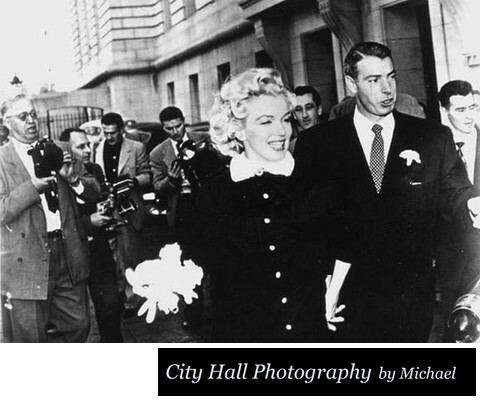 Yes, in 1954, blonde bombshell, Marilyn Monroe married Joltin' Joe Di Maggio in a private room at San Francisco city hall. Of course the privacy was short lived as the press and hundreds of well wishers mobbed the happy wedding couple as they tried to flee immediately following their nuptials. The 3rd floor hallway, (one of our favorite places to photograph wedding couples) was one of the areas they were trapped! Shortly after the wedding, they moved into a cute place in the SF Marina District, but then divorced after only 274 days of marriage. Many believe that it was Joe's jealousy of people ogling his wife that led to the divorce. The wedding captured the imaginations of people all over the country, it was one of the major events to occur at San Francisco City Hall since it had been rebuilt. People still talk about it today! Joe DiMaggio was born in Martinez, California but got his start playing baseball for the San Francisco Seals. As most people know, he want on to a very successful baseball career with New York Yankees. Marilyn tragically passed away way too young. With a height of 307 feet, the Dome of San Francisco City Hall is the tallest in the United States. It is actually 42 feet higher than the dome at our nation's capital building in Washington DC. The dome's surface is intricately finished in 23.5 Carat gold leaf. It was beautifully refinished during the earthquake retrofit of 1990. 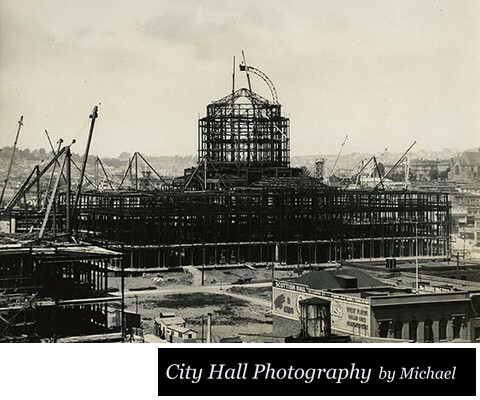 The dome of Old City Hall was the only part of the building left standing after the devastating 1906 San Francisco Earthquake ruined the rest of the structure in just a few seconds (see photo at the top of page on the right). It is easy to see why so many couples want to come to this building to get married. The beauty and history are overwhelming. The Rotunda floor at city hall features an intricate design and is made of Tennessee pink marble. At certain times of the day the marble reflects light in an amazing way adding drama to wedding photos. It almost takes on a pinkish gold hue if that is even possible. The Grand Staircase was fire hosed down in May of 1960 to repel a student protest that occurred in the main Rotunda. Albert Samuels designed a clock that overlooks the stairs. His Jewelry store was known as "The House of Lucky Wedding Rings." Quite appropriate considering the 35 or so wedding couples that walk down these stairs daily. Both of these locations are very popular with married couples and tourists! I have yet to photograph a wedding at San Francisco city hall where the couple did not want their photos taken on the Grand Staircase. The crowds can sometimes make it difficult but we always try. Despite all of it's glory after being rebuilt, after 80 years the building was falling into disrepair. The Loma Prieta Earthquake was the final straw. Fortunately, Mayor Willie Brown, a visionary pushed to have the old building restored and made safer. He wanted to make San Francisco city hall into a place where they would be proud to host major events and activities. As part of the restoration, a large amount of oak paneling, marble and limestone walls and floors, and many chandeliers were cleaned up and made to look like new. The old ugly acoustic ceilings were removed revealing the original marble that it had covered. Barriers were removed to reopen old skylights, giving the building an airy feel again. An incredible 50,000 stone pieces and 25,000 units of hardware were removed. Once safely taken out, they were fully cleaned, restored and put back in place. The meticulous attention that was paid to maintain historical detail earned rave reviews from architects, preservationists and residents. Willie Brown received kudos for the risks he had to take to get it all done and of course there was always political disagreements about how to spend the money. The Mayor even devised a clever way to get the dome gold leafed again after the money he sought was voted down. He used $500,000 in private funds to get this done, but referring to the job as an art piece that could be seen throughout the city. 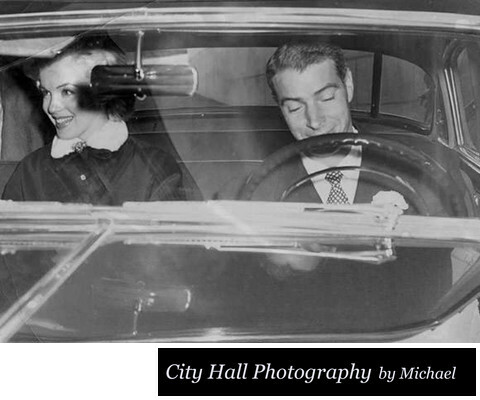 To read more about his vision and triumphs check out this article about the renovation of San Francisco City Hall. It didn't turn out to be quite the "Taj Ma Willie" that some of his greatest critics predicted, but it DID became a place that San Francisco could be proud of again! San Francisco City Hall now plays hosts to many major local events including the grand opening of the SF Symphony and the annual Google Party!